Nuclear Power – Bill Gates unveils his vision for the world’s energy future, describing the need for “miracles” to avoid planetary catastrophe and explaining why he’s backing a dramatically different type of nuclear reactor. Space Monkey from Leo Burnett on Vimeo. Created as a collaboration between World Wildlife Fund (WWF), Ben Lee and Leo Burnett, “Space Monkey” carries a message about our planet, and features Ben Lee’s track, “Song for the Divine Mother of the Universe”. Climate change, and policy responses to it, will have potentially large implications for global economic performance and development. Deteriorating climatic conditions could lead to sizeable reductions in output and productivity, particularly in the least developed countries; and in exposed sectors such as agriculture, fisheries, and tourism. In addition, increased levels of greenhouse gases (GHGs) bring the risk of catastrophic events, such as massive flooding of coastal and deltaic areas. Policies responses—both efforts to reduce emissions and adapt to the consequences of climate change—will also impose costs on the global economy (although, if efficiently implemented, these are expected to be lower than those associated with inaction). Reducing emissions, for example, will require incentives for significant investment in clean energy, and to discourage activities with high emissions. In line with its mandate, the IMF focuses on the macroeconomic, fiscal, and financial challenges of climate change and related policies. Climate change mitigation is one of the world’s foremost policy challenges. In line with its mandate and expertise, the IMF is focused on the macroeconomic, fiscal, and financial impacts of climate change and related policies. The Fund’s activities in the area of climate change are largely demand-driven, and focused on providing advice to member countries where climate change can have a significant impact on economic and financial stability. It also aims—for example through its research activities—to promote understanding of the difficult issues of fiscal policy cooperation and design, likely to arise in agreeing and implementing a successor to the Kyoto Protocol, the framework of which is due to be established at the United Nations Climate Change Conference in December 2009. Climate change is in many respects a unique and particularly difficult global economic problem. It involves a global spillover since emitters of greenhouse gases do not bear all the costs from the damage they cause. There is a strong mismatch between the (early) costs of action to limit its extent and the (later) benefits from doing so; and also large differences in how countries have contributed to climate change, and how they will be affected. Finally, there are pervasive uncertainties, including the risk of a catastrophic impact of climate change on living conditions on our planet. Macroeconomic challenges – A chapter in the Spring 2008 World Economic Outlook on climate change and the global economy sets out the macroeconomic challenges posed by climate change and policies to address the problem. It emphasizes that policies to mitigate climate change can have potentially rapid and wide ranging macroeconomic consequences. The required establishment of a price on emissions of greenhouse gases would affect countries’ economic growth, saving and investment levels, capital flows, and exchange rates. Yet the chapter also reports simulation results that show how these costs can be minimized if policies are well designed. In particular, policies should be long-term and credible, yet flexible enough to be able to adjust to emerging information and changing economic conditions; and implemented as broadly as possible, while being managed so as to ensure an equitable distribution of costs. Fiscal implications – A policy paper prepared for the Executive Board of the IMF deals in more detail with the fiscal implications of climate change. These take many forms. Climate change will directly affect tax bases and public spending needs, but beyond this there is also a more purposeful role for government tax and spending policies. To mitigate climate change—that is, reducing its extent by cutting emissions—fiscal instruments (emissions taxes, or cap-and-trade schemes to limit emission) are needed to ensure that the full environmental cost is borne by emitters of greenhouse gases. Underlying fiscal policy for mitigation is the basic principle that any emitter of greenhouse gases should face the marginal cost to the entire world society of doing so. While this is a simple principle, it raises formidable conceptual and implementation problems, requiring worldwide efforts and solutions. Public expenditure on adaptation—learning to live with changing climatic conditions—will also be required to reduce societies’ risk exposure through better infrastructure, coastal protection, education, health and water services, and meet other challenges of changing climate. Such expenditure is expected to rise as climate change progresses and could reach more than US$100 billion annually, by 2030 or earlier. Implications for financial markets – Climate change has implications for financial markets to, with innovative instruments—such as catastrophe bonds and weather derivatives—providing a way to manage some climate-related risks. These too are discussed in the WEO chapter and policy paper, and also in an article in the March 2008 issue of Finance & Development, which contains several articles on macroeconomic aspects of climate change. The Fund continues to contribute to key fiscal policy issues relating to climate change, including as part of recent policy analysis on food and fuel price subsidies. In the case of fuel markets for example, reducing subsidies is a key first step towards more positive emissions pricing. In addition, Fund staff are preparing a Special Issues paper on the public economics of climate change. • the appropriate structure of environmental tax systems. Some of these issues may interact with climate policy issues (such as when reduced deforestation also leads to lower carbon emissions, and when less local pollution is associated with less burning of fossil fuels). However, to some degree, they are also stand-alone issues which, when they become significant to macroeconomic performance, warrant IMF attention. COPENHAGEN – New computer modeling suggests the Arctic Oceanmay be nearly ice-free in the summertime as early as 2014, Al Goresaid Monday at the U.N. climate conference. This new projection, following several years of dramatic retreat by polar sea ice, suggests that the ice cap may nearly vanish in the summer much sooner than the year 2030, as was forecast by a U.S. government agency eight months ago. One U.S. government scientist Monday questioned the new prediction as too severe, but other researchers previously have projected a quicker end than 2030 to the Arctic summer ice cap. “It is hard to capture the astonishment that the experts in the science of ice felt when they saw this,” said former U.S. Vice President Gore, who joined Scandinavian officials and scientists to brief journalists and delegates. It was Gore’s first appearance at the two-week conference. The group presented two new reports updating fast-moving developments in Antarctica, the autonomous Danish territory of Greenland, and the rest of the Arctic. “The time for collective and immediate action on climate change is now,” said Denmark‘s foreign minister, Per Stig Moeller. But delegates from 192 nations were bogged down in disputes over key issues. This further dimmed hopes for immediate action to cut more deeply into global emissions of greenhouse gases. Gore and Danish ice scientist Dorthe Dahl Jensen clicked through two slide shows for a standing-room-only crowd of hundreds in a side event at the Bella Center conference site. One report, on the Greenland ice sheet, was issued by the Arctic Monitoring and Assessment Program, an expert group formed by eight Arctic governments, including the United States. The other, commissioned by Gore and Norway’s government, was compiled by the Norwegian Polar Institute on the status of ice melt worldwide. Average global temperatures have increased 0.74 degrees C (1.3 degrees F) in the past century, but the mercury has risen at least twice as quickly in the Arctic. Scientists say the makeup of the frozen north polar sea has shifted significantly in recent years as much of the thick multiyear ice has given way to thin seasonal ice. In the summer of 2007, the Arctic ice cap dwindled to a record-low minimum extent of 4.3 million square kilometers (1.7 million square miles) in September. The melting in 2008 and 2009 was not as extensive, but still ranked as the second- and third-greatest decreases on record. Last April, the U.S. National Oceanic and Atmospheric Administration predicted that Arctic summers could be almost ice-free within 30 years, not at the 21st century’s end as earlier predicted. 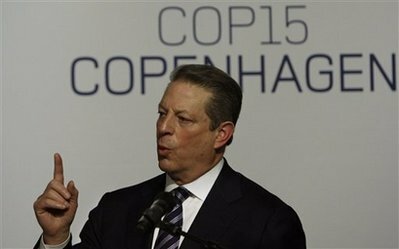 Gore cited new scientific work at the U.S. Naval Postgraduate School, whose Arctic ice research is important for planning polar voyages by Navy submarines. The computer modeling there stresses the “volumetric,” looking not just at the surface extent of ice but its thickness as well. 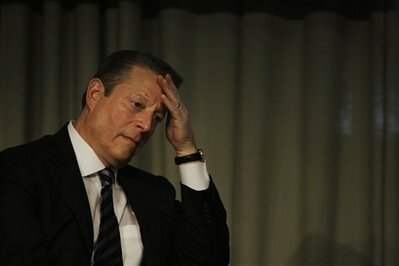 “Some of the models suggest that there is a 75 percent chance that the entire north polar ice cap during some of the summer months will be completely ice-free within the next five to seven years,” Gore said. His office later said he meant nearly ice-free, because ice would be expected to survive in island channels and other locations. Asked for comment, one U.S. government scientist questioned what he called this “aggressive” projection. Meanwhile, what’s happening to Greenland’s titanic ice sheet “has really surprised us,” said Jensen of the University of Copenhagen. She cited one huge glacier in west Greenland, at Jakobshavn, that in recent years has doubled its rate of dumping ice into the sea. Between melted land ice and heat expansion of ocean waters, the sea-level rise has increased from 1.8 millimeters a year to 3.4 millimeters (.07 inch a year to .13 inch) in the past 10 years. Jensen said the biggest ice sheets — Greenland and West Antarctica — were already contributing 1 millimeter (.04 inch) a year to those rising sea levels. She said this could double within the next decade. “With global warming, we have woken giants,” she said.